"Romney stuff was harder to move," says Bob Levine, marketing director for Madco Printing & Advertising, a St. Louis printer that sold about 400 of its $30 T-shirts to the Romney campaign in Missouri. Now, he says, they may go for much less. "I don't see a major market for this stuff," he says. Not even among ironic hipsters? 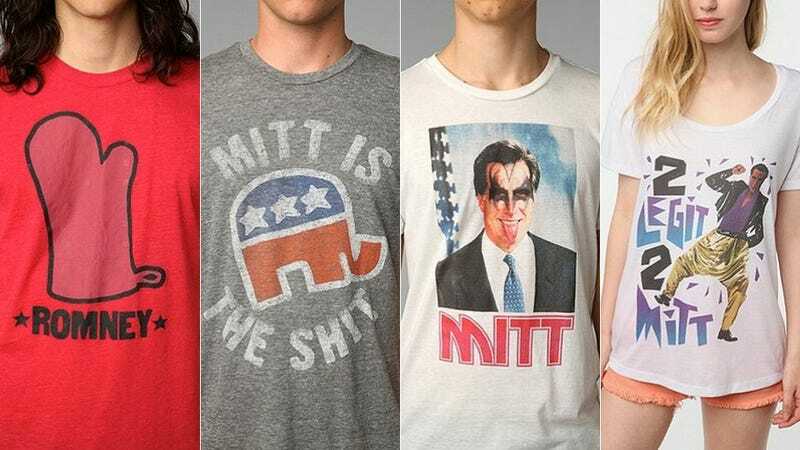 By Christmas, many Latin Americans may be sporting Romney gear, says Alan Garada, president of World Trade, a merchandise recycler and reseller that four years ago sold overseas about 150,000 unused McCain-Palin T-shirts donated by the campaign. Vivienne Westwood says, again, that she is not a feminist. Why not? Because women in "the privileged world" don't, in her opinion, need to be. "Another reason is because I live in the privileged world I would never accept the idea that somehow I am a victim of society. Just by being born a woman!" But she definitely feels that "women in — other cultures, let's call it — should be supported. And in our culture if they are somehow in the position of victims. But I think men are victims just as much really and I think in our society it would be really scary to be a man." A flat shoe offers speed, better balance and comfort. "We have these lives that are complex and busy," says Brooke Jaffe, fashion director of women's accessories at Bloomingdale's. "We walk all day. And there's an expectation that you'll look polished." One quality power flats share: They look like if they were used to kick someone — it would hurt. Pointy toes, metal toe caps and embellishments, including spikes, are some of the details that give these flats power. They also call attention to themselves with strong colors, shine or vivid patterns like leopard. "I'm getting a divorce," Duffy snaps. [...] "You're the first journalist I've told. You can tell everyone I'm very happy. My daughter and I — we're doing good." "Karl Lagerfeld decided to come to my ball in Paris [for French Vogue's 90th anniversary] dressed in a burqa so he wouldn't be recognized ... he was arrested outside," she said, "so he didn't come to the party, but there were three our four people that came dressed as Karl Lagerfeld, so it made up for it in a way." "I've been in the business a long time, and I basically asked everyone I knew for a favor. There was no way we could have afforded to have some of that stuff made—the jewelry, the furs. People had a passion for the project and wanted to help. I had the jewelry re-created by this company Skinny Dog Design Group, and 14 Carats Beverly Hills, and they did it for me at cost. The furs came from an archive in Beverly Hills, too. You have to use the authentic thing, I mean the movie is about Liz and her glamour so how can you skimp on that? If I had not gotten the discounts, if I had to pay for everything, it would have been half a million dollars."